Migration watch; 08.10 - 12.30hrs. On the move (south unless stated) were 2 Little Egret, 2 Greylag Geese, 1 female Marsh Harrier, 12 Black-headed Gull, 1 Common Gull, 3 Sandwich Tern + 3 north, 5 Swift north, 257 Swallow, 26 House Martin, 20 Sand Martin, 3 Flava, 1 Tree Pipit, 74 Linnet + 2 north and 16 Goldfinch. A Coot on Johnson's Marsh was unusual and the drake Scaup was still on Peasholm Park. 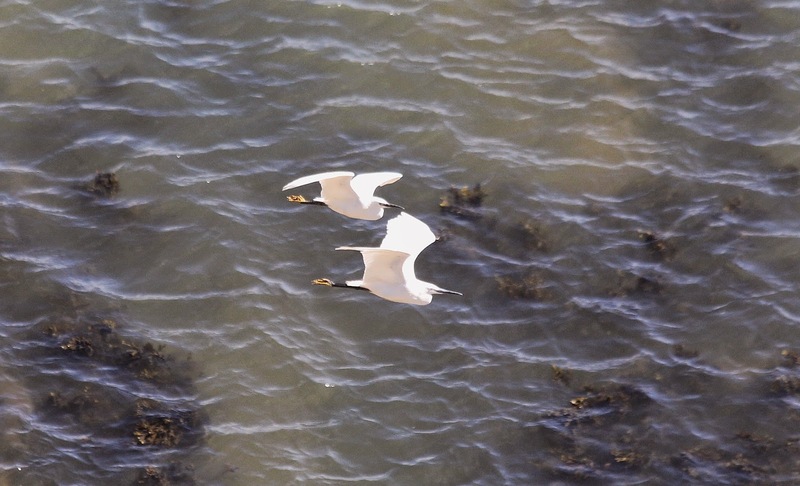 Little Egrets on the move south - Michael McNaghten.